What is the Bega Valley Seed Savers? Bega Valley Seed Savers is a volunteer group dedicated to growing and saving the seeds of non-hybrid and heirloom varieties of mostly edible plants. We are part of the national Seed Savers network, that promotes and supports local networks to save, sort, dry, share, store, and distribute seeds. It is a living bank of plant varieties, as seeds only keep fresh if we keep growing them and eating them! Saved seeds are suited to local conditions as they are sourced and swapped locally, this also means the seed is often fresher. By continuously selecting the best plants to save seed from we promote strains suitable to our region, and possibly even create some local varieties. LSNs stop the erosion of our food crop diversity and actually increase the genetic base. Varieties of food crops are shrinking. In the last century 75% of garden varieties disappeared as fewer and fewer people grow and collect their own food and seed. Five multinational companies control 40% of the global vegetable seed market, breeding chemically dependent hybrids and recently some are genetically modified as well. Seed corporations produce 'one size fits all' seeds often grown in countries where the labour is cheap rather than in environments similar to our own. Another threat to biodiversity is the patenting of plants by the Plant Breeders Rights Act (PBRs). Here plants are bred and the result patented and grown on a massive scale. The resilience automatically available in a more diverse system of food production becomes at risk as food biodiversity is reduced. The Irish Potato Famine is an example of the kinds of disaster that kind strike when all our 'eggs' are in one basket. Farmers used to collect their own seed with many locally adapted varieties all over the world, now because of many pressures they have become dependent on seed companies. 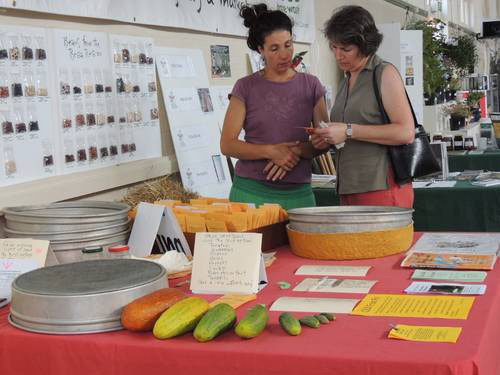 Exchanging knowledge, swapping seed and feeling more self-reliant as a community is enriching, and eating fresh locally grown food is a delicious and healthy pleasure.